Just because we don’t see the snow, doesn’t mean that we shouldn’t celebrate the festive season will full on Christmas cheer! That means, Crafty is throwing this Festive season's BIGGEST PARTY for our amazing band of followers. 3. Christmas Gift Bag - Full of Goodies! Christmas away from home can sometimes be tough which is why each year we call out to all the expats of Shenzhen ,bringing the community together to celebrate the festive season with style - with lots of Mulled Wine, beer, delicious food, festive songs and lots of good cheer of course! 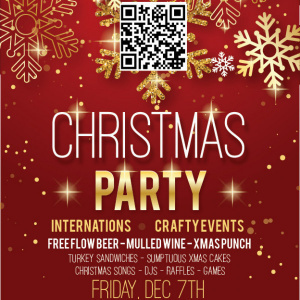 Get in on the Christmas fun on Friday 7th December for a Christmas party you’ll never forget. With heaps of entertainment to get you into your favourite Christmas jumper, free flowing drinks including hot mulled wine, Vedett white, Christmas punch, festive food such as turkey and cranberry sandwiches, plus a Christmas Goodie Bag on arrival for the first 100 guests. We aim to fill the room with music, laughter and festive cheer with special performances and raffles with some truly amazing prizes! Sing away to your best Christmas songs and enjoy the company that Crafty and Internations has to offer you on this awesome evening! Thank you - we can't wait for Christmas to come to Shenzhen! Little Mix Bakery, a small yet mighty bakery in the heart of Shenzhen - creates a bespoke range of cupcakes, cakes and other delicate desserts that will wow your taste buds. Hanover are true experts at not only choosing the best quality beans but roasting in the best way to bring our the unique flavours of each and every bean. Their roastery in Changde, creates single origin and blends for every occasion.